Replacement housing to take the place of run-down high-rise family housing in towers. The site is re-organized to reflect the fabric of the typical San Francisco street with 3-story walk-ups. Every unit has a street front entry and address. 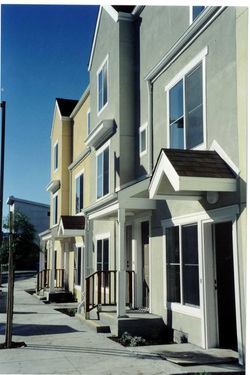 The apartment buildings are designed to look like townhouses which reflect ownership housing. Density is 53 units per acre and each unit has access to private outdoor rear yard space. Parking is in front of the units and the parking area can be fenced for security if needed in the future.